Nationality: French. Born: Ivo Livi in Monsummano Alto, Tuscany, Italy, 13 October 1921; raised in Marseilles, France, from age two. Family: Married the actress Simone Signoret, 1951 (died 1985), stepdaughter (adopted following Signoret's death): the actress Catherine Allégret; son with Carole Amiel: Valentin. Career: Left school at age 11, and worked at a variety of jobs before becoming a singer in Marseilles and Paris; 1945—performed at Moulin Rouge; Edith Piaf helped him in his career; 1946—feature film debut in Étoile sans lumière with Piaf; 1950–51—six-month musical tour of Europe and North Africa; 1953—breakthrough role in Le Salaire de la peur ; 1954—appeared with Signoret in stage play The Crucible , and in film version, 1957; 1958—highly publicized and criticized tour of Soviet Union and Eastern-bloc countries, with Signoret; 1959—one-man show on Broadway; 1965—co-starred with Signoret in Compartiment tueurs , first of several films by Costa-Gavras; 1968—acclaimed oneman show in Paris; late 1970s—released enormously popular album of songs, Montand d'hier à aujourd'hui ( Montand, from Yesterday to Today ); 1982—became first popular singer to perform solo at New York's Metropolitan Opera House, followed by U.S. caberet tour, then tour of Brazil and Japan; 1986—acclaimed performance in pair of international hits, Jean de Florette and Manon des sources ; produced and starred in one-man TV special, Montand à la une ; 1987—named president, Cannes Film Festival; 1988—long politically active, received serious mention as a possible French presidential candidate, but he declined to pursue; 1991—at time of death, was preparing a singing tour. Awards: Best Actor awards, French Étoile de cristal and New York Film Critics Circle, for La Guerre est finie , 1966; special tribute, Film Society of Lincoln Center, 1988. Died: Of a heart attack, in Senlis, France, 9 November 1991. Du soleil plein la tête , with Jean Denys, Paris, 1955. Tu vois, je n'ai pas oublie , with Herve Hamon and Patrick Rotman, France, 1990; published as You See, I Haven't Forgotten , New York, 1992. Interview in Talking Films: The Best of the Guardian Lectures , edited by Andrew Britton, London, 1991. Megret, Christian, Yves Montand , Paris, 1953. Cannavo, Richard, and Henri Quiquere, Yves Montand: Le Chant d'un homme , Paris, 1981. Laneque, M., and R. Gallot, Montand: De Chansons et images , Paris, 1981. Remond, Alain, Montand , Paris, 1981. Monserrat, Joëlle, Yves Montand , Paris, 1983. Semprun, Joseph, Montand: La vie continué , Paris, 1983. Desneux, Richard, Yves Montand: L'artiste engagé , Lausanne, 1989. Pascuito, Bernard, Montand: le livre du souvenir , Paris, 1992. Ginies, Michel, Yves Montand , Paris, 1995. Hamill, Pete, "Yves Montand," in New York , 6 September 1982. Current Biography 1988 , New York 1988. Obituary in New York Times , 10 November 1991. Montand , documentary directed by Jean Labib, 1994. After a brilliant beginning as a cabaret singer, helped along the way by Edith Piaf, Yves Montand made a number of films that were disappointing. In fact, just at the time when he was about to abandon his film career, he accepted a role in Clouzot's Le Salaire de la peur that made him famous as a film star. The film, full of dramatic tension, depicts the desperately courageous trip of four drivers with a dangerous load on a treacherous road, and is now reckoned to be—because of its subject, its technical qualities, and its performances—one of the finest films of its time. Yet for the next decade Montand's films were not successful. Only in the late 1960s did he manage to move in a natural way before the camera, and from the time of his making Compartiment tueurs onwards, his acting took on an authority it lacked before. La Guerre est finie , Vivre pour vivre , and Un soir, un train show this, especially the last, about the complicated relations of a couple seemingly on the boundary of dream and reality. With his association with the director Costa-Gavras, which began in 1965 with Compartiment tueurs , his acting reached a mid-career peak. His participation in Costa-Gavras's politically oriented works reflected his own political convictions, about which he was never silent. Z and Etat de siège deal with the restriction of civil rights in Greece and Chile, respectively. In L'Aveu , based on a book by Arthur London, one of the accused in Slansky's trial in Czechoslovakia, he created with a shocking persuasiveness the character of a man who suffers the monstrous power of a state determined to make good its charges of conspiracy, betrayal, and class and racial hatred. Montand also made comedies and love stories as well as crime stories. In Le Fils he created the character of a mafioso who returns to Corsica from America and is involved in a vendetta, and in La Choix des armes he played a man in whose house two escaped convicts take shelter. He acted with Cathérine Deneuve in Le Sauvage , with Romy Schneider in César et Rosalie and Clair de femme , and with Isabelle Adjani in Tout feu, tout flamme . Although he had a notable late-career comedic role in 1983's highly praised light comedy Garçon! playing the waiter, Montand's film career had hit a valley in the late 1970s and early 1980s. A final climax would come in 1986, however, with his scheming village elder in the wonderful two-part multicontinent smash hit Jean de Florette and Manon des sources . 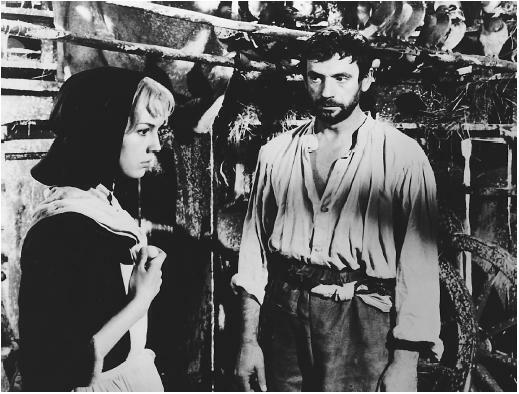 Based on novels by Maurice Pagnol, the films were made back-to-back by director Claude Berri in the costliest production in France up to that time. For his part, Montand drew on his rural Italian roots in perfectly capturing a proud old peasant whose greed leads ultimately to an ending reminiscent of Greek tragedy. In one of his best performances ever, Montand held the central role through both films, even next to Gérard Depardieu's strong portrayal of Montand's nemesis in Jean de Florette —a fitting culmination to the career of an actor beloved by his fellow French and unusually popular outside France as well.